Reignite a youthful glow with the Balance Me Radiance Face Oil; a silky, quick-absorbing formula that promises to hydrate, illuminate and target signs of ageing. Fortified with Amazonian Buriti Nut, Camellia and Rosehip Oils, the radiance-reviving blend helps to soften the appearance of fine lines, scarring and discolouration for a smoother, younger-looking complexion. Nourishes and protects whilst delivering long-lasting moisture and hydration to reveal bright, even skin with a luxurious fragrance of Rose Otto. Warm two drops of oil in clean palms and massage using gentle circular movements across a cleansed face, neck and décolleté. Prunus Amygdalus Dulcis (Sweet Almond) Oil, Vitis Vinifera (Grape) Seed Oil, Aleurites Moluccana (Kukui) Seed Oil, Simmondsia Chinensis (Jojoba) Seed Oil, Rosa Canina (Rosehip) Fruit Oil, Mauritia Flexuosa (Buriti) Nut Oil, Moringa Oleifera (Moringa) Seed Oil, Camellia Oleifera (Camellia) Seed Oil, Tocopherol (Vitamin E), Anthemis Nobilis (Roman Chamomile) Flower Oil¹, Achillea Millefolium (Yarrow) Leaf Oil¹, Styrax Benzoin (Benzoin) Resin, Limonene², Linalool², Geraniol², Citronellol². (¹) natural pure essential oil, (²) naturally occurring in essential oils. I have dry skin that needs a boost and I love the radiance and extra moisture it gives. I use morning and night under moisturizer in day, on its own at night. It's not oily as it sinks in so nicely. I prefer it to the Rose Otto one which is much oilier so not good for daytime. This one is a great addition to my regime and I will be buying again. Have been using this sporadically since I purchased it in April however I'm not convinced it is for me. I have combination, congested skin and I have used many types of oil on my face without any problem however this gave me mixed results. I tended to use it at night or during the day when I was home having a make up free day. I agree that it leaves skin soft, supple and relaxed but I am not convinced that it calms my complexion or eases any of the acne congestion. In fact, I suffered a major breakout the first time I used it though this may well be coincidental. Also, irrespective of how little I use, I found it rarely absorbed fully and there was always quite a bit left on my skin. Whilst this certainly helped my skin glow, I did not like the feel. I read that you need exfoliated skin to ensure that facial oils absorb properly and so I tried this as well but I still found that absorption was an issue. 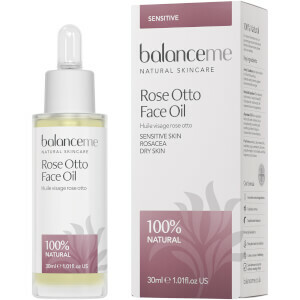 I have since switched to Balance Me's Rose Otto Face Oil which is far more suitable for my skin needs. It is lighter, it smells divine and it absorbs beautifully leaving little trace on the skin. It also works wonders with my skin calming any redness and congestion and gives me nice glow which has led to many positive comments. I still use a drop or two of the Radiance Face Oil from time to time instead to see whether it reacts better with my calmer skin but I still find it does not absorb as well, leaves a greasy sheen on my skin and causes congestion. Was a bit worried about using an oil on my face, but this product is amazing. My skin feels so soft and a small drop goes a long way. It's true it does gives you radiance. I don't use it everyday though. I have been using this product for some time and love it. I have sensitive skin and am past the first flush of youth and this does amazing things to the texture and appearance of my skin. A fabulous product well done Balance Me. This product is so amazing. It does what is says on the package, totally. And the GLOW it gives. Grab it, totally worth it. This is the third bottle I have purchased since discovering this oil. I love the way it makes my skin feel velvety. You only need a couple of drops as it sinks into the skin well. I have mature dry skin and it works for me!